[265 Pages Report] Veterinary equipment and consumables are used in animal hospitals and clinics for various applications, such as anesthetic medication, respiratory support, temperature management, and fluid management. Veterinary equipment is also used in basic biomedical and medical research. 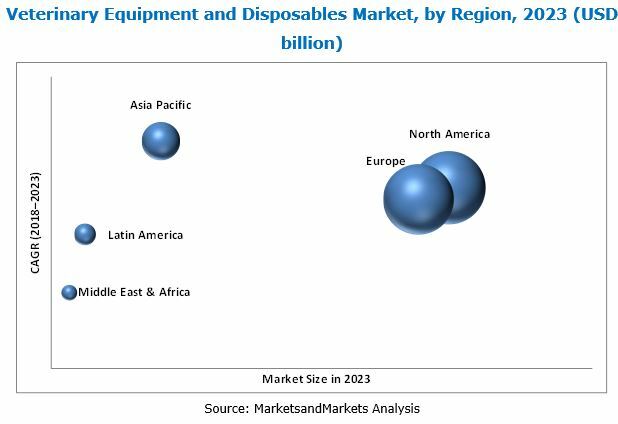 The global veterinary equipment and disposables market is valued at USD 1.63 billion in 2018 and projected to reach USD 2.40 billion by 2023, at a CAGR of 8.0%. Rising animal health expenditure and a growing demand for pet insurance, increasing number of veterinary practitioners in developed regions, and growth in the companion animals market are the primary drivers for the global veterinary equipment and disposables market during the forecast period. The base year considered for the study is 2017 and the forecast period includes 2018 to 2023.